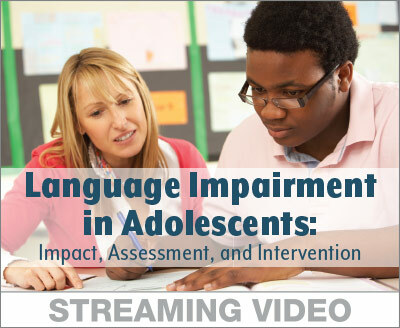 This video course provides much-needed information on the nature of language development and impairment in adolescents, including the impact of language impairment on adolescents’ academic experiences and interpersonal relations as well as implications for their vocational and social success as adults. Using evidence and case studies, the course offers guidelines and tools for assessment of adolescent language impairment and presents key principles and strategies for intervention. You'll get online access to all the course content, including the full video, handout, references, and appendices, so you can access it from anywhere! Self-assessment—Think about what you learned and report on the Completion Form how you will use your new knowledge. For group discounts, call Product Sales at 1-888-498-6699.